Looking for a wedding that is as fun and adventurous as you and your partner? Imagine floating over the stunning Arizona Sonoran Desert and among the clouds while reciting your vows, taking your partner’s hand in marriage, then toasting with champagne and gourmet catered fare in the heart of the desert, celebrating the romantic adventure that just ensued. It’s not something of dreams, this can be your reality. The Hot Air Expeditions team is here to take care of every detail of your big day, to ensure you have the wedding of your dreams, and wedding memories that stand the test of time. Whether you and your partner are looking for something small and intimate, or a grander scale ceremony, a formal setting, or more casual, we have something for every taste and style. Whatever your hot air balloon wedding vision is, we are here to make it a reality! 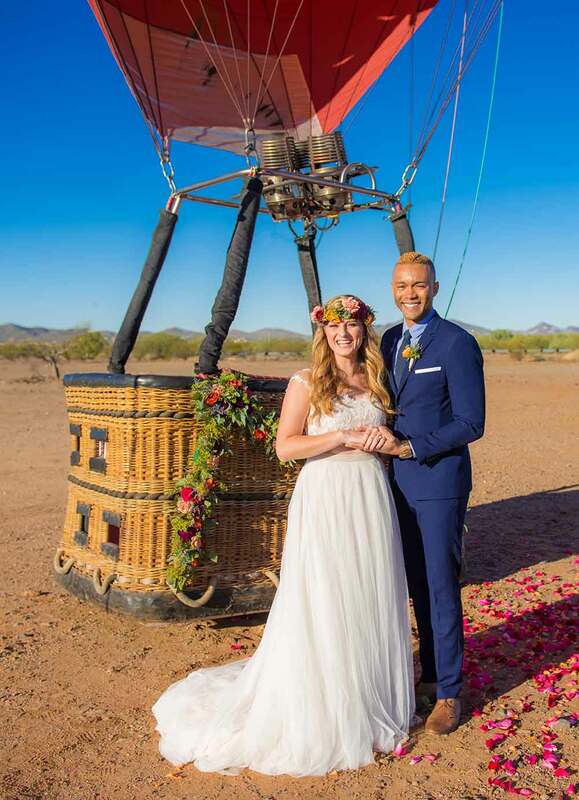 We work with a team of Arizona’s best of the best to offer one-of-a-kind hot air balloon wedding packages that include a wedding officiant, florals, catering, photography and videography, all customizable based on your vision and desired inclusions. Discover our pre-packaged options below, or contact us to further customize your special day. Hot air balloons are an exciting and unexpected addition to any wedding, whether your special day takes place up in the air, or on the ground. In addition to hot air balloon weddings, we also offer additional hot air balloon elements that can be incorporated into your wedding celebration including hot air balloon rides as a wedding weekend activity, facilitating tethered hot air balloon rides at your wedding or reception, and utilizing a hot air balloon as a stunning backdrop for engagement and wedding photo shoots. Experience our ultimate hot air balloon wedding package which includes the full array of our enhancement options, for the day, and ceremony, of your dreams. The Wedded Bliss Package includes a private flight for two with roundtrip transfers, one of our skilled hot air balloon pilot wedding officiants, full floral enhancements, professional photography and videography coverage of your ceremony from beginning to end, as well as champagne and gourmet cuisine to cap off your special day. This package is a wonderful option for those looking to include special touches for your big day, but retain a more simplistic outlook. Our Flying High Package includes a private flight for two with roundtrip transfers, one of our skilled hot air balloon pilot wedding officiants, choice floral enhancements, professional photography coverage of your ceremony from beginning to end, as well as champagne and gourmet cuisine to end your special day on a high note. The Essentials Package is perfect for couples who appreciate a hot air balloon wedding for its simplicity and effortlessness. This package includes a private flight for two with roundtrip transfers, one of our skilled hot air balloon pilot wedding officiants, and post-flight champagne and gourmet cuisine to celebrate the romantic adventure. Looking to take your reception to the next level? Tethered hot air balloon rides are a fun, unique and unexpected experience to entertain reception guests and party-goers alike. These gentle giants stand as high as a 10 story building, and can be seen for miles. While up in the air, guests get a taste of the ballooning experience with a 5 minute tethered ride, soaring up to 50 feet in the air, and taking in the event and surrounding landscape from up above. View our tethered balloon rides video below for a glimpse at how breathtaking and exhilarating these are to have at receptions and events. Please fill out the form below to request information about our Hot Air Balloon Wedding Packages. We look forward to learning more about your dream wedding experience!